The anglicised form Slievanea would appear to derive from Ir. Sliabh an Fhia, 'mountain of the deer'. The deer is also an important symbol in Celtic mythology. In many tales they lure people into the realm of the gods. Remains of several fulachta fia (venison-cooking pits) can be found around Lough Adoon. Slievanea is the 241st highest place in Ireland. 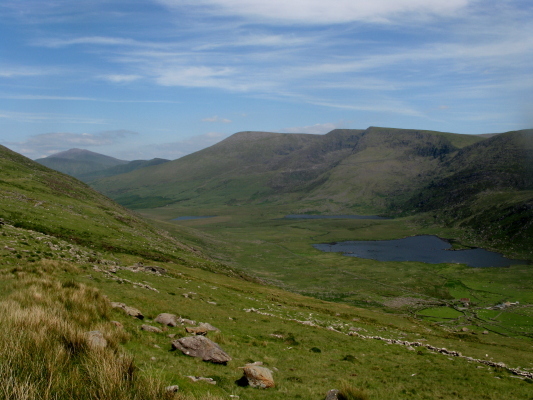 Slievanea is the second most westerly summit in the Central Dingle area. Cross the main road and head due east uphill following a distinct track for 200 meters, leave this track as it swing sharply south and continue uphill and east, skirting cliffs to your left side. These are steep cliffs, so keep some distance from them.